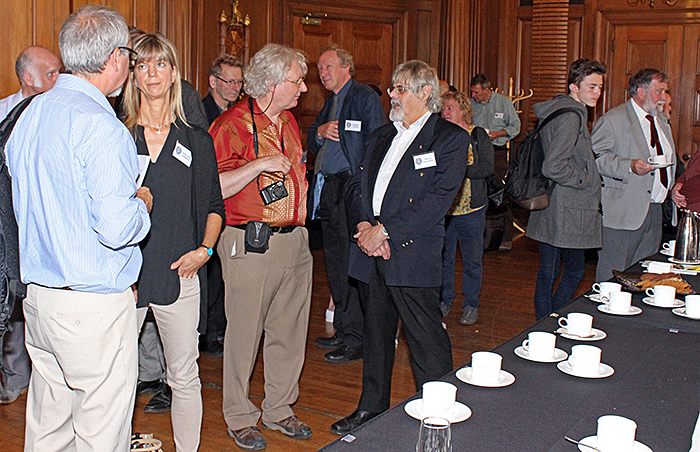 There is an extended version of this report in the Members’ Area with lots more photos and videos of the presentations. 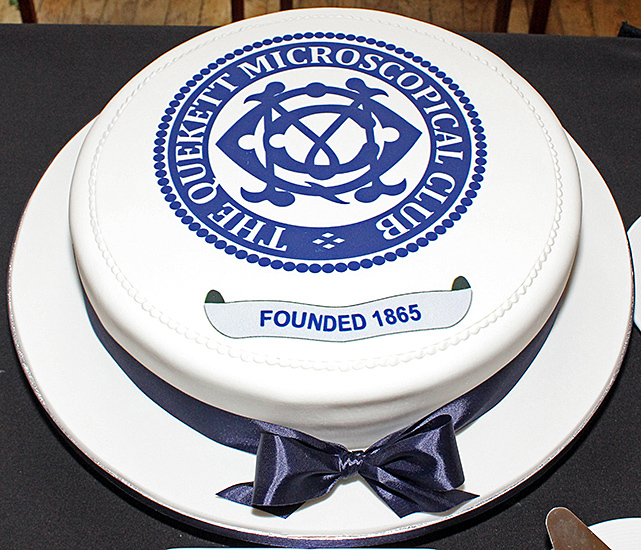 This meeting to mark the 150th anniversary of the Quekett Microscopical Club was held at the Royal College of Surgeons in London, where John Thomas Quekett, the Victorian microscopist after whom the Club is named, used to work. 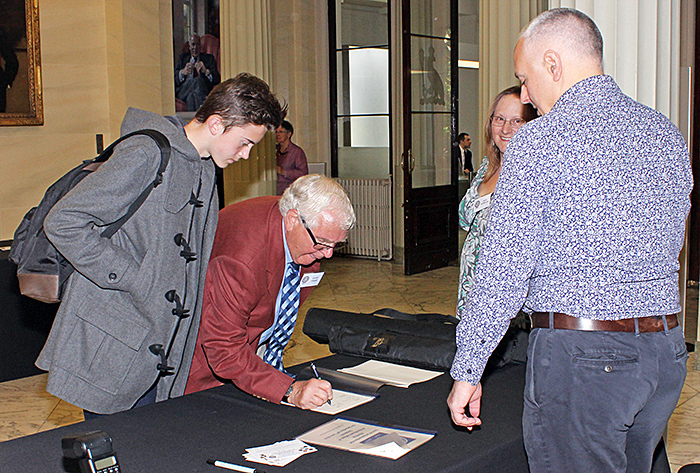 The event was attended by around 120 people, including about a quarter of the Club’s members and Wim van Egmond and some of his colleagues from the Netherlands. 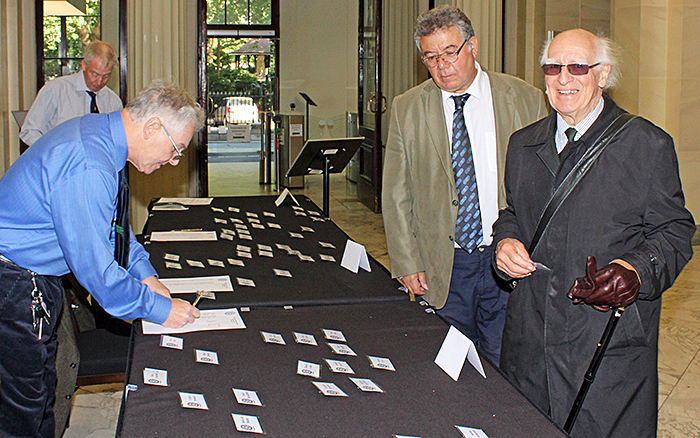 The reception team of Barry Wendon, Paul Smith, Jacky McPherson and Mark Papp did a great job of handing out the name badges that Joan Bingley had prepared, persuading everyone to sign the attendance book, and then directing them to the Committee Room for coffee, tea and biscuits. 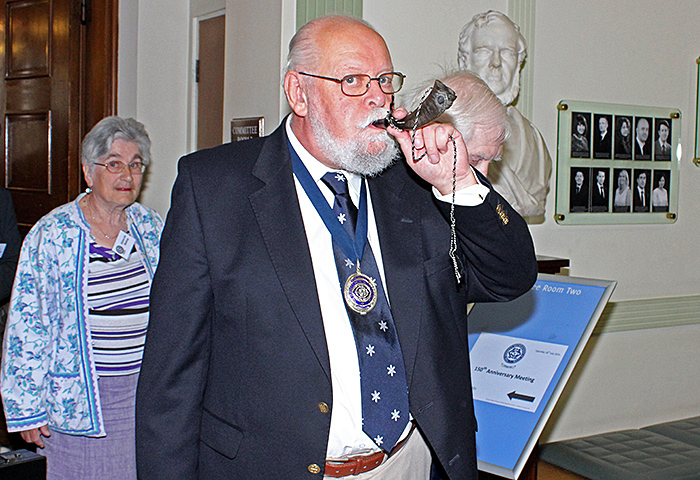 Just before 10 o’clock, the Club’s President Carel Sartory blew a horn to summon everyone to Lecture Theatre 2 (the Cuthbert Wallace Room) for the start of the proceedings. 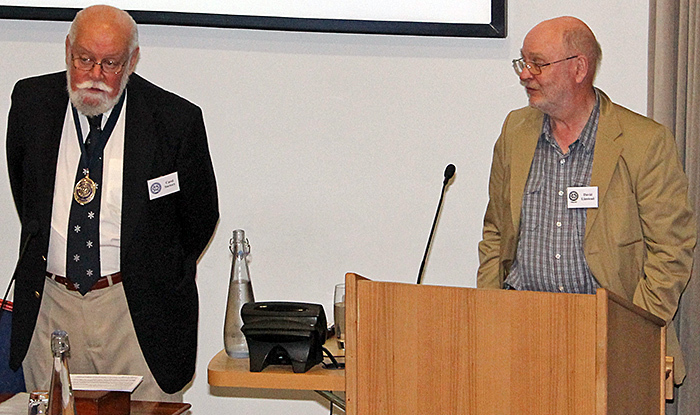 Carel Sartory welcomed everyone and then handed over to the Club’s historian Brian Bracegirdle for the first presentation, on the history of the Club since its foundation in 1865. Brian is writing a book on the history of the Club, due to be published around March 2016, and showed us some fascinating items from the archives including old programmes and photographs of meetings and excursions showing the absence of lady members and a rather formal dress code! 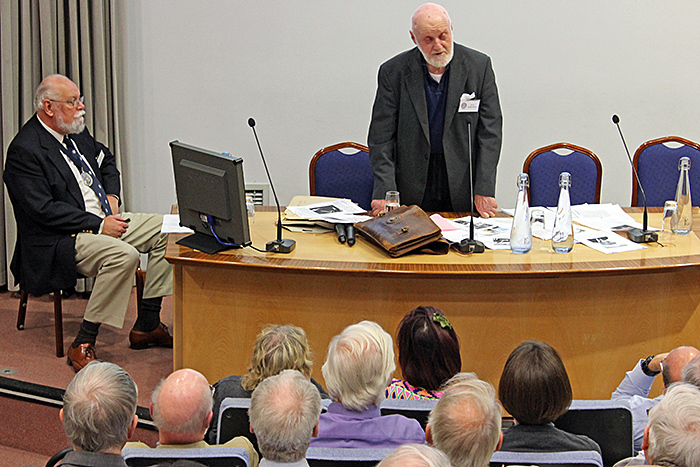 Brian told us about the various locations of the Club (including the Royal Society), some notable presidents, and the development of the Journal and the Bulletin. 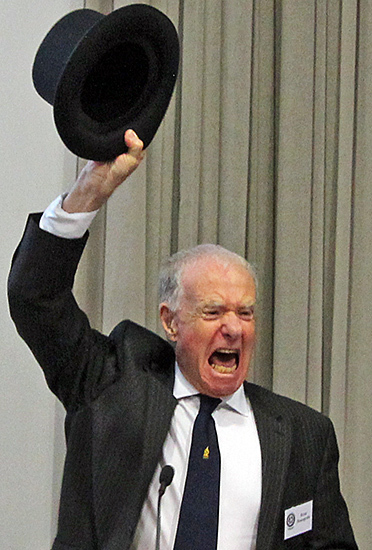 At the end of his presentation, Brian took us all by surprise by producing a silk top hat! After a break for tea, coffee, biscuits and gossip, we returned to the lecture hall for the second presentation, David Linstead on modern photomicrography techniques. 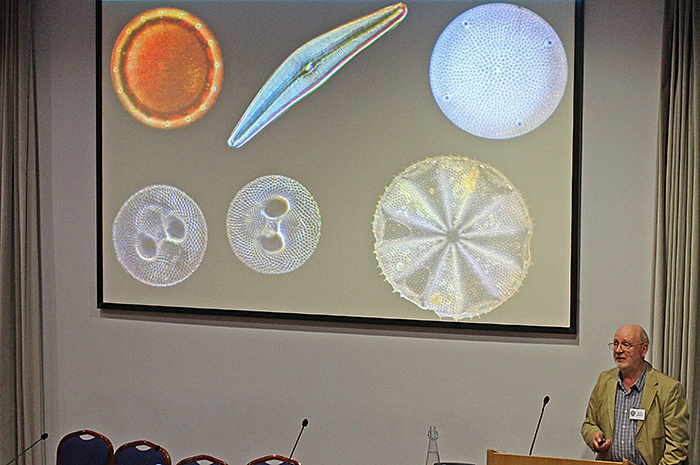 David Linstead is well known to microscopists for his prize-winning photomicrographs, most recently a phantom midge larva in the Light Microscopy – Life Science section of the 2015 Scientific Imaging Competition run by the Royal Microscopical Society. 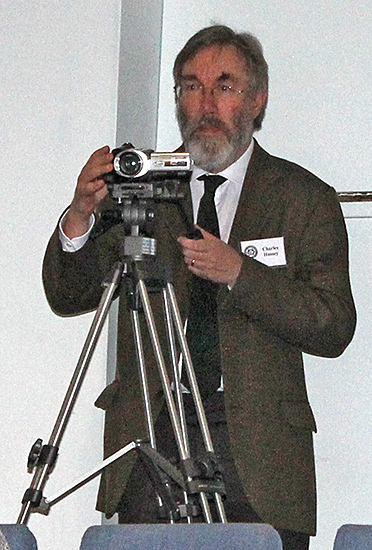 He explained the advantages of digital cameras over film cameras, including instant results, image manipulation without a darkroom, the ability to eliminate vibration from the mirror and the shutter, extended depth of field using stacking, and high-resolution plus wide field of view using stitching. He explained his acquisition of microscopes, starting with a Nikon Diaphot inverted, then a black trinocular Leitz Ortholux, and his progression of digital cameras from a Nikon Coolpix 4500 (used afocally) to a Canon EOS 5D Mark II that is an ideal replacement for a 35mm SLR. For stacking, David started with Combine, then Helicon Focus and now mostly Zerene Stacker, and for stitching he uses Microsoft ICE. David also showed us a selection of his photomicrographs. 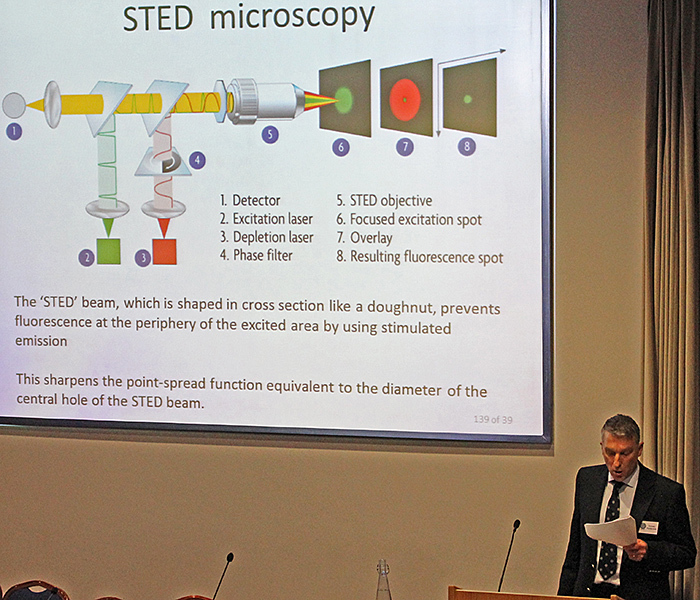 The final presentation of the morning was by Jeremy Sanderson, manager of the Bio-imaging Facility at Harwell. Jeremy explained 6 cutting-edge light-microscopy techniques, multi-photon and non-linear microscopy, endogenous fluorescent protein labels, the Mesolens, super-resolution microscopy, light-sheet microscopy of living cells and the Airyscan principle. 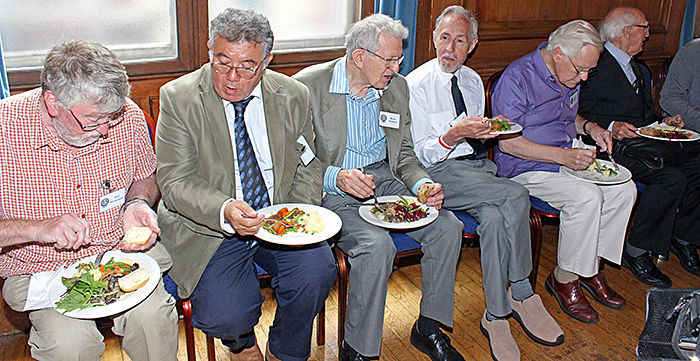 We all needed a break after struggling to understand the techniques that Jeremy had carefully explained to us, and it was time for lunch, an excellent 2-course buffet laid on by the College. 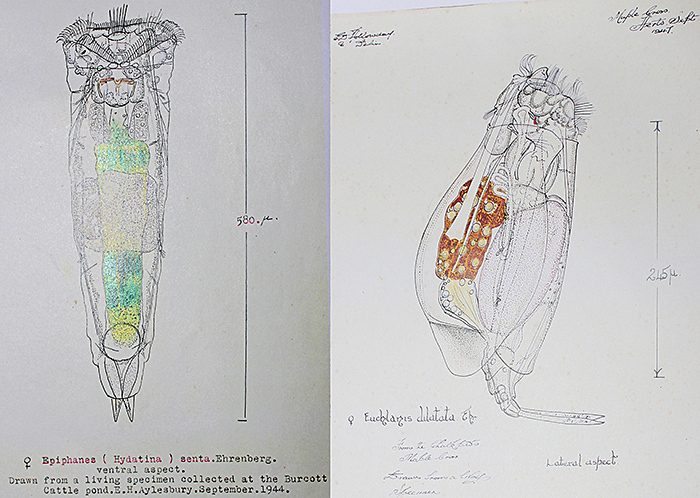 At one end of the room where we had lunch, Eric Hollowday had laid out several of his drawings of rotifers for us to admire. 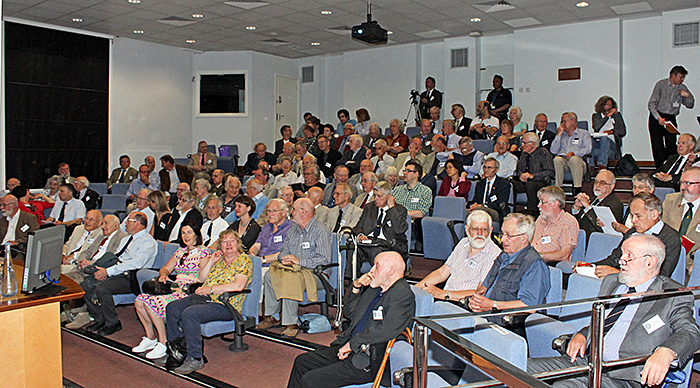 After lunch, we returned to the lecture theatre where Carel Sartory introduced Eric Hollowday, who is not only well-known for his extensive knowledge of rotifers but is also one of the longest-serving members of the Club, having attended his first meeting at the age of 16 and joined over 70 years ago. 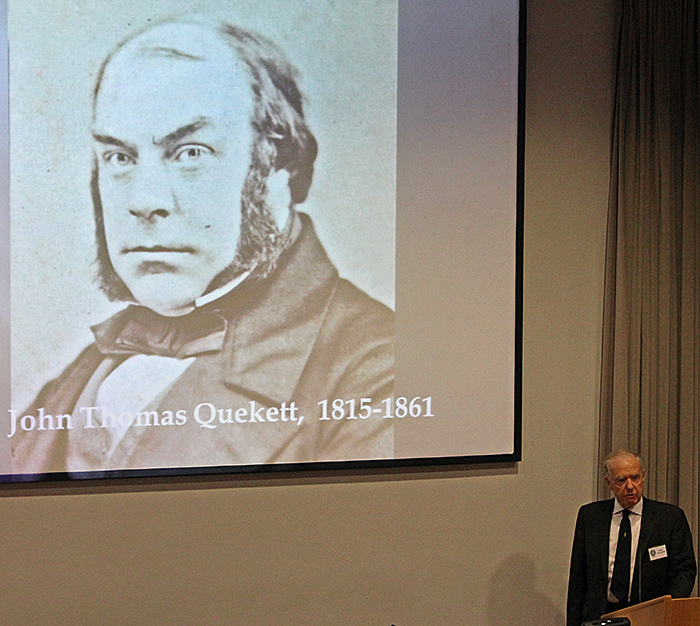 Eric told us how he became interested in rotifers and the support that he received from older enthusiasts, how he struggled to find the Royal Society’s rooms in Burlington House for his first Quekett meeting, and how groups of Quekett members carrying microscopes picked their way through people spending the night on the platforms of deep Underground stations during World War II. 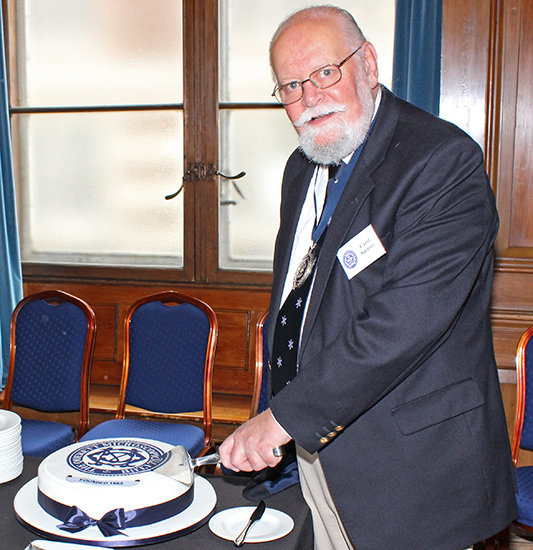 He recalled that the older members when he first joined had memories of the early years of the Club, and entertained us with anecdotes about several of the Presidents and other personalities that he had known, some of whom had featured in Brian Bracegirdle’s presentation. 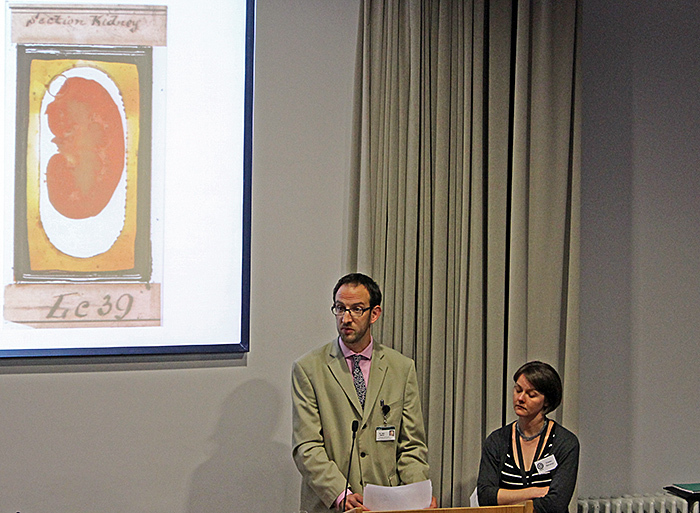 The final presentation of the day was by Sam Alberti and Emmy Bocaege of the RCS, who showed us examples of the slides and other preparations made or collected by John Thomas Quekett. 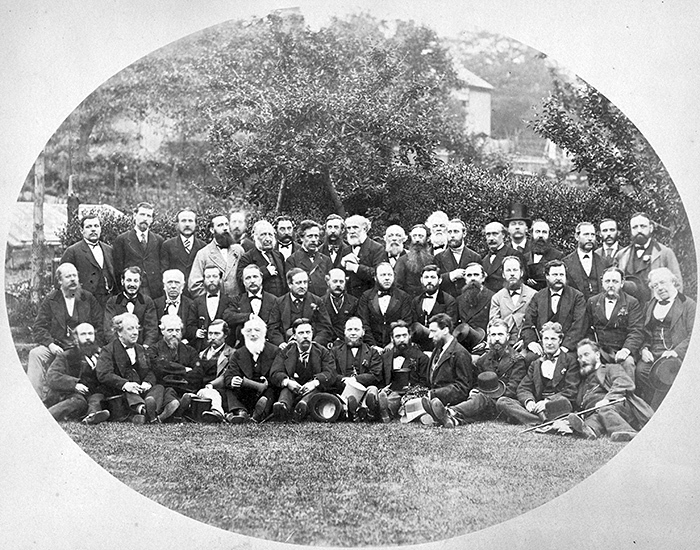 Sam and Emmy are involved in a project that is partly funded by the Club to catalogue, conserve and photograph the slides and to make images of them available on the College’s website. Emmy has been examining Quekett’s notebooks to find information about the slides. 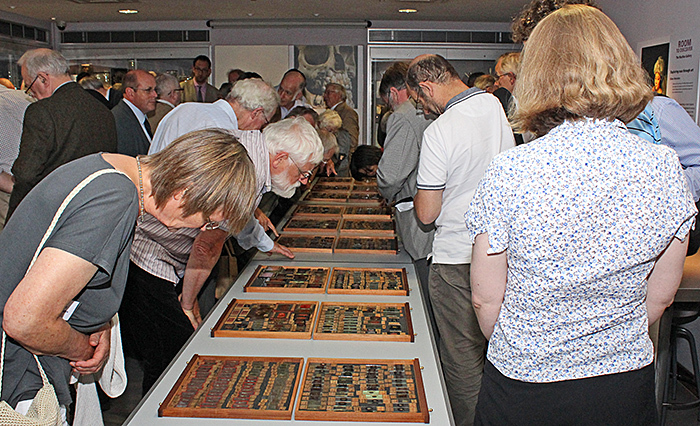 After the presentation, we all went upstairs to the Hunterian Museum where hundreds of Quekett slides from the College’s collection had been set out for a private viewing. For the closing session, we all went downstairs to the Committee Room for refreshments (including a slice of iced sponge cake) and for Carel Sartory’s closing remarks. 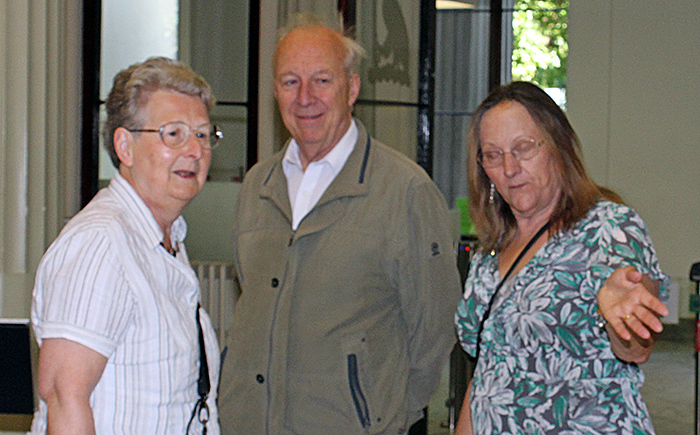 Carel Sartory thanked the people who had given presentations, the College for hosting the event, the Club members who had organised the event, and the members and guests who had made the day such a success.